Welcome to our beautiful SEA VIEW, holiday apartment, in Bundoran, on Co. Donegal's golden Wild Atlantic Way Coast. Our FAMILY FOCUSED Apartment offers a spacious, high-spec., luxurious, light and airy, space. Our design focuses on the needs of families with young children. We prioritise freedom, with safety and fun for all, whatever the weather. Our contemporary, two- bedroom, top floor apartment, is in MARINE COURT, in the town centre; across the road, from the Atlantic Ocean, with unspoiled views over Bundoran's Atlantic Ocean and Classie Bawn, Mullaghmore. We offer fresh, modern facilities, sleeping up to 8, (including a child - under two), catering to all your family’s needs. Travel cot and high-chair provided, for the Under 2s. Kid-proof tableware for children, board games, TV and washing machine, with balcony airer for washing and drying, particularly on rainy days. All bed - linen and a hand-towel are provided for our guests. We have taken care to provide water-proof mattress protectors, keeping children's comfort in mind. The master bedroom has 1 double bed, with two bedside lockers and 2 mirrors. The second bedroom, has single bunk beds, a single bed and plenty of space for the travel cot ( blanket and sheet provided), for an under two year old child. There is a long dressing mirror, with ample wardrobe, drawer and storage space; there is also a double sofa - bed in the living area. We offer instant electric heating throughout. Hot-press in bathroom, with shower and bath, with safety railings and anti-slip mat. The extensive kitchen / living area, has washing machine / clothes airer / iron & board / unobtrusive flat-screen TV (for quality family time) / fridge-freezer / electric cooker & oven / microwave / electric flamed fire. We offer a substantial range of cooking utensils, crockery and glassware - for both adults and children. Fisher Price High Chair for Under 2 child. We have created a Seaside -Themed Space,where you make your own Treasured Family Memories. We aim to provide a safe, family space @ Bundoran Beach, for ALL the family! Sleeps 7 Plus Baby, in Secure Gated Community,CCTV, close to all amenities. Secure, Free,On-Site Parking-First-Come, First-Served Basis. 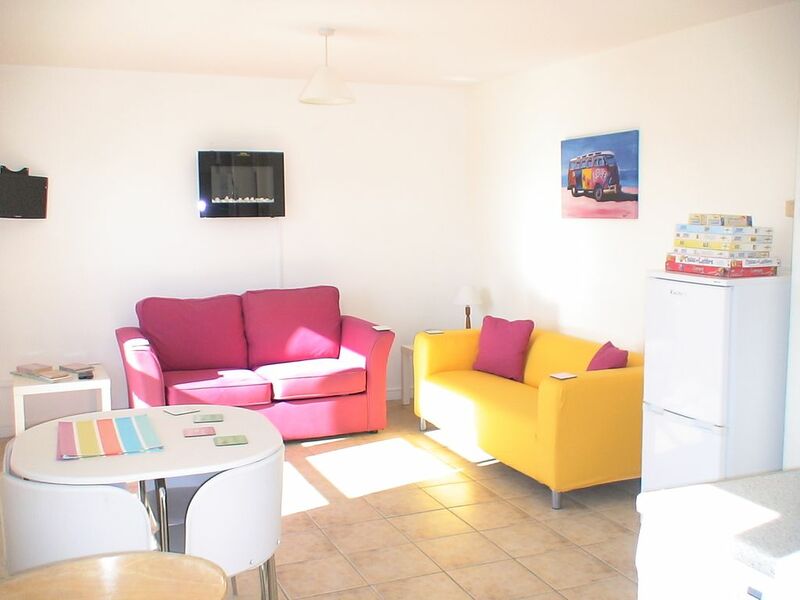 Leave the car-walk yards to the Beach, Swimming @ Water World, Surfing/Hire, Go-Karting, Golf, Horse-Riding, Supermarkets, Restaurants, Cinema, Cafes, Bars & Casinos. Great Coastal Access! Make your own treasured family memories! As a family with two young children, which loves to travel, we appreciate what you need when you leave your home. With this in mind we have tried to create a HomeAway, where you and your family can come and relax and enjoy all that we have to offer, without the hassle. We love this place because it is as close to the sea as you can get in this area. We love it all year round as the atmosphere and the things that we do, change with the seasons. Brace yourself for a walk on the beach all alone in Winter and enjoy the comings and goings of the day trippers, the party goers, the families and the holiday makers in summer. Crisp, bright, long evenings in Autumn and a sense of all that is to come in Spring. Our apartment is ideal for families travelling with babies, toddlers and young children.We have provided appropriate bedding and linen, high chair, kid-proof crockery and glassware and a bath. The washing machine helps you to travel lighter (with a young family), and the balcony airer means you can dry swim/beach gear/laundry at all times of the day and in all seasons. Small details such as board games and children's books are in abundance. The focus is on families enjoying "togetherness". We deliberately do not provide WiFi. The bathroom has a nautical, child friendly theme. Bath for children or for adults to soak in, with an intergral electric shower, complete with safety rail and anti-slip mat. The mirror has an extra light above it for your convenience. We provide a shelving unit, under the sink for your toiletries. There is further storage for your luggage in the hot-press with extra shelving. We provide 3 hand towels and 3 bath towels per stay. Floors are ceramic tiles with a bath mat outside the bath. The beach is right across the road from the apartment. The apartment is located right in the centre of Bundoran town. View of the Atlantic Ocean, over Mullagmore, directly from the main living area. The view of Bundoran Central Beach and The Peak, are from the shared sun terrace at the front of the complex. Duvets with covers, pillows with protectors and pillow cases, waterproof mattress protectors (for children's comfort) and sheets provided. Washing machine with strong spin speed provided. Balcony airer for hanging wet towels and washing. No tumble dryer. Electric, heat-giving, fireplace with natural glow. One free parking space is available for a car or people carrier (only).First-come, first-served basis. Parking all around outside of complex. Cars come and go all day watch for a space! Seating for 5 in living room, but integral with open plan kitchen and dining seating. View over Atlantic Ocean. Fridge with three drawer freezer. Electric 4 ring electric stove-top hob. Electric oven with stove top. Substantal amount of kitchenware. Kettle, crockery and cutlery for 7. Varied utensils for cooking/serving food. Kitchen/dining/living area in one open plan space. Two tables, one seats 4 one seats 3; high chair; ample pots and pans and lots of crockery and glassware provided for adults & for kids. Unobtrusive, wall-mounted, flat-screen TV, with Irish Freeview (Saorview). Assortment of books for children of various ages. Assortment of family board games and jigsaws for all ages. Guests can rent a range of water sports equipment in various outlets in the town - 50 meters from our apartment. The sun terrace is located at the front of the apartment complex and is available for use by all guests. Bundoran is a huge area for surfers from all over the world Guests can rent a range of water sports gear in various outlets in the town - 50 meters from our apartment. Across the road at The Great Northern Hotel, there is an 18 hole Links Golf Course which can be used on a pay-as-you-go, daily basis. There is no lift in the complex (yet) and the apartment is located on the 2nd floor, with only access via stairs. "Waterworld" - an indoor public water adventure park/ swimming pool and is located just across the road from the complex. Marine Apartments is the only gated complex in the area and boasts quality accommodation with privacy, safety and security. Perfect for a family with children, perfect for those travelling with a small family pet, perfect for a group, perfect for anyone who wants to get away from it all. Come and enjoy all that the area has to offer. Secure,Free,On-Site Parking-First-Come, First-Served Basis. Leave the car-walk yards to the Beach, Swimming @ Water World, Surfing/Hire, Go-Karting, Golf, Horse-Riding, Supermarkets, Restaurants, Cinema, Cafes, Bars & Casinos.Great Coastal Access!